Download WIC Resetter Free. Reset Epson Printers Waste Ink Counters Utility. | | WIC Reset Utility. Reset the Waste Ink Pad Counters by WIC. WIC Reset Utility means Waste Ink Counters Reset Utility. This Utility has been developed for making service procedures with inkjet Epson and Canon printers such as printhead power cleaning, fatal error codes reading, waste ink counters read and reset, print quality pattern printing etc. So, it is very important to know the current values of Your printers Waste Ink Counters. It is very easy to check by WIC Reset utility. It is free option. Download and install the latest WIC Reset Utility version here. See video tutorial – How to read current values of Waste Ink Counters. See video tutorial How to Reset Waste Ink Counters by WIC Reset Utility. As You can see in video You have to buy Reset Key for Waste Ink Counter Reset. This Reset Keys is for One Reset only. 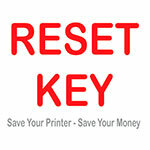 This Reset Key can be used for all supported printer models. Please before You decide to buy Reset Key – check if Your printer model is supported by WIC Reset utility – see video tutorial How to check if WIC supports my printer model. Pay attention what functions are available for Your printer model. Some models have Read Waste Ink Counters option available – that means You can read Waste Ink Counters values, but RESET function is NOT available. This is because some printer models have separate Maintenance Ink Cartridge, which has its own IC chip . So this IC Chip can be reset by hardware Chip Resetter only. It can’t be reset by any Software. So, please pay attention to this fact and first check Your printers model support. After You reset the Waste Ink Counter – the Reset Key will became used. You can check the Reset Keys status very easy. See video tutorial How to check Reset key status. NOTE: Different models have different functions available. Check available functionf for Your printer model first. See video tutorial How to check available functions? Best regards for using free WIC reset utility. Be informed about your printers Waset Ink Counters values. Don’t get Your printer Stopped!